Carrion : Primarily sheep and deer in upland areas. Sheep placenta and docked tails often taken. Dead fish can be taken. Invertebrates : Worms, beetles and large flying insects. The Red Kite is a supreme generalist in regards to its diet. The diet is very varied and any local food source can be exploited. Carrion is most readily available in the winter when mortality of wild and farmed animals may be highest. At this time carrion is an important part of the kites diet. During the breeding season when adult kites have young to feed, live prey is taken in larger numbers. The kite is not a particularly powerful or aggressive bird for its size. It has a relatively weak bill and feet, this limits the prey it may take live. Small mammals such as rabbits and rats are commonly taken. During the breeding season when there are lots of juvenile birds of other species available they may be important in the diet. Juvenile crows such as magpies are often taken. Small birds may be taken during the breeding season but are less important in the diet. Large numbers of invertebrates are taken at certain times of the year when they become available to the kites. This commonly happens when fields are ploughed or silage cut. Worms can be very important in the diet of the red kite. Potentially any species can be taken as carrion. 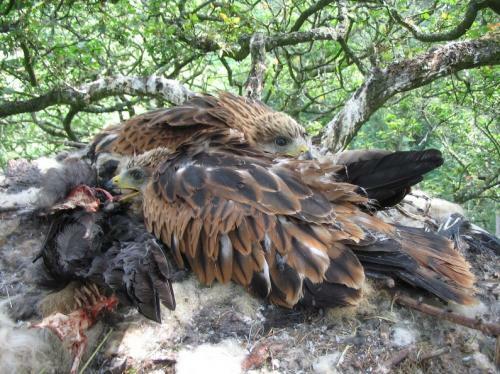 Any species that the kite may find dead may be fed upon, this will be commonly be sheep and deer in upland areas. Many other species may be taken as roadkill.